1. In a large saut� pan over high heat, saut� mushrooms and onions in butter. 2. When the mushrooms are browned and cooked through and the onions are soft (about 8 minutes), add the herbs de Provence and spinach. Cook until the spinach is softened, about 4 minutes. 3. Add Boursin cheese, half and half, salt, and pepper. Cook just to melt the cheese. Add hot sauce to taste. Keep warm. 4. Heat a medium saucepan with about 4 inches of water and the red or white wine vinegar until the water is barely simmering. 5. Meanwhile, cut just the top from the Kaiser rolls. Scoop out the inside so as to leave about 1/2-inch on the sides and bottom of the rolls. Place the rolls on a baking sheet and place in a 350 F oven for about 10 minutes, or until the rolls are lightly toasted and hot. 6. While the rolls are in the oven, crack eggs into individual bowls. Gently slide each egg into the water so as to keep it as together as possible. Once the eggs firm up, you can even try to envelope the yolk with the white by carefully wrapping the white around the yolk with a slotted spoon. 7. Cook the eggs for 3-5 minutes or until the whites are solid and the yolk is still soft. Remove from the water and place on a plate. Season with additional salt and pepper. 8. 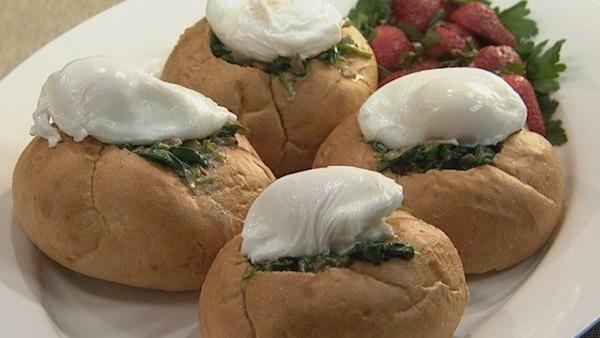 To serve, fill the hot rolls with the hot spinach mixture. If the spinach mixture is not creamy, add some water and reheat. Top with a poached egg and serve.